Philip and Therese Corken with Jonathan McMullan (Lisburn SAFE), Trish McCormick (Hilden Community Association) and Cllr Jonathan Craig. A Lisburn family whose home has been attacked four times in as many months say they have no idea why they are being targeted. The family - Philip and Therese Corken and their four sons - have lived in their home at Limehurst Way in the Low Road area of the city for two decades. Philip and Therese Corken with the large stone that was hurled through the bedroom window of their Limehurst Way home on Friday morning. They have enjoyed living in the quiet street and say they have never had any bother until the attacks on their home started out of the blue a few months ago. The first attack took place at around 2am on September 19 when two windows at the front of the property were smashed. Around a month later the living room window was broken again. The attacks continued on December 1 when a tin of white paint was thrown at the house, smashing a window and causing damage to the exterior of the property. And the most recent incident occurred at around 6am on Friday, December 16 when a large stone was hurled at the house, smashing through the window of an upstairs bedroom as Philip and Therese were sleeping. “The two of us were lying in bed at the time. It woke us right out of our sleep. The noise was horrendous,” Therese said. The Corken family are at a loss to explain why they are being targeted and have appealed for the attacks to stop. “It’s a really quiet street and we can’t believe this is happening,” Therese continued. “I’ve lived here all my life and never had any trouble. We just don’t know what is going on here. I’d love to know what’s behind it all and I want it to stop. We have no inkling and the local community have been asked and nothing is coming back from them either. Philip and Therese said the terrifying attacks have left them “on edge” and at their wits’ end, despite the Housing Executive installing additional security measures at their property. “We are under an awful lot of strain at the minute as we don’t know what’s going on,” Therese continued. “All we’re getting back from the community is ‘quiet family, decent family, sons no bother, all lovely people’. That’s all we’re getting, so we have no idea why this is happening. We’re pulling our hair out trying to work out why this is happening to us. At first people were saying it was mistaken identity, but this is four times now so it’s not likely to be mistaken identity. The Corkens believe the same man, possibly aged in his early to mid 20s and around 5ft 10 to 6ft tall, was responsible for all four attacks. It’s understood the man has been spotted running away from the scene on a number of occasions, always in the direction of Grovehill Avenue. The Catholic family say they have no reason to think that the motive for the attacks is sectarian, pointing out that they have never had any issue in the past 20 years. Jonathan McMullan, volunteer coordinator with Lisburn SAFE, and Trish McCormick, Chair of Hilden Community Association, have been offering the family help and support in the wake of the attacks. They too are at a loss to explain why the Corkens are being targeted. 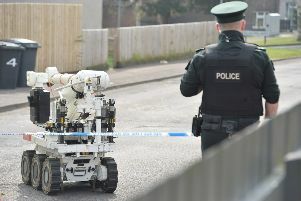 DUP Councillor Jonathan Craig, who has been in contact with the police and Housing Executive on the family’s behalf, called for people to help bring the individual responsible for the attacks to justice. “Whoever this individual is or whatever their motive is behind all of this, it is absolutely bewildering. This is a family who have lived in this community for decades and is well known and well liked by all their neighbours so we are at a complete loss to try and understand what is going on here and what’s behind this,” he said. Police are investigating the “repeat incidents of criminal damage” and have vowed to step up patrols in the area in a bid to deter the perpetrator. Investigating officers have appealed for anyone with information to contact them at Lisburn Station on 101 quoting reference 162 16/12/16. Information about the attacks can also be passed on anonymously via the Crimestoppers charity on 0800 555111.